Well, the panel isn't going to be done in time for Midlands tomorrow. I am quite a bit saddened by that, but it's for the best. I spent 20 minutes looking for the documentation I needed for a shortcut I was going to take (and it is totally period, but it's still a shortcut) so I could save two kiln firings and try to make it happen. I decided it was best to not do it, make it the way I wanted, and HOPEFULLY send it with someone to Pentamere in a few weeks. That way I can still enter it at Kingdom. After I fire them all I will repeat it with a second coating overall, so there is no clear glass and two tones of grey. I'm slightly tempted to pick out highlights again, and have three tones of grey, accept the deviation from the "co-geo-contemporaneous" panels. Three levels of shading is period, but I don't know that it was ever used for grisailles. Using wine as a vehicle for the paint is fascinating. I am using a somewhat sweet white wine as a vintner friend suggested (specifically a moscato, very specifically the sparkling moscato from Cooper's Hawk Winery). The glass is sticky as a result. The paint is hard to scrub out; I'm not certain if that is because of the wine or if I inadvertently added more gum arabic than usual. I suspect the wine because Elskus mentions using table sugar as a binder. I imagine the sweetness of the wine could be introducing the additional grip. Because it's what was more local, I'm going to try a test batch of paint with cider instead of wine, though that isn't documented in any of the period sources. It makes sense and I can imagine a Norman glazier using it happily. In order to scrub the pieces out I'm having to dip my hog bristle scrub into wine. It's really more like I'm rewetting the paint and removing it with a paper towel most of the time, where as with water I usually brush the dry dust off. If I remember correctly vinegar is described as giving a hard protective shell to the paint that can resist water (and save on firings). This seems to have a similar effect. I'm also glad it's a little cold for bugs, yet; I think plenty of them would be interested in the sugar. At Pennsic I will likely need to paint with vinegar (citable) or forego it for water. The third documentable item in Theophilus is urine, which I don't intend to try soon. I'm somewhat relieved that I'm missing Midlands tomorrow; as I go I discovered a few pieces that were painted incorrectly. At least one, a corner, I was talked into leaving alone. Two pieces ended up with no ivy leaves, however, and they stand out when taken as a whole. After I get the shadings done I think I will go back over some of the pieces and strengthen lines, add in missing leaves, etc. My favorite of the three, this book features English glass and fits neatly into the SCA period, stopping shortly before 1600. It has plenty of black and white photos, some large, of panels I hadn't seen before. It has a section of nice color photos as well. A chapter details the fabrication of the windows, which is nice. There are several discussions of symbolism and the sources of symbolism in glass and a chapter on glass as images into daily life. There is also a chapter on funny and grotesque windows I'd love to put into a class I was thinking about called "Transparent Blasphemies" featuring unusual, humorous, or somewhat less PG-13 glass. A good book featuring full color pictures. The book is well done, but rather specific to Canterbury Cathedral. I purchased it for a few very specific bits of information, but it's a good read for info on guilds, training, and so on. 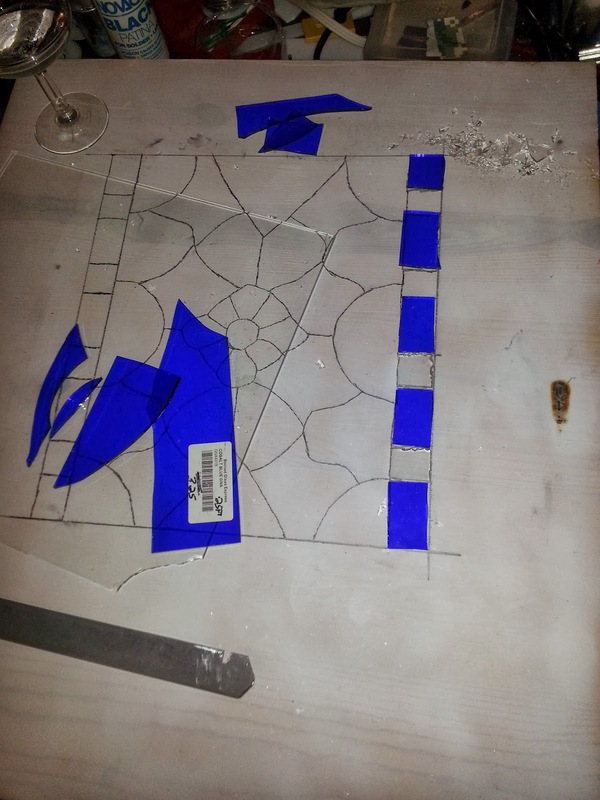 Finished cutting the glass for my panel, got the key lines painted on as well. The first half is firing right now. Unfortunately looking at the picture I see a problem and I'll have to redo one of the pieces heh. I decided to try and freehand paint it all, which is weird for me. I ALWAYS trace. It was fun. Today I got two books in and a new sample of porphyry. Fortunately this looks like "the right stuff!" The surface was completely smooth and didn't grind very well. 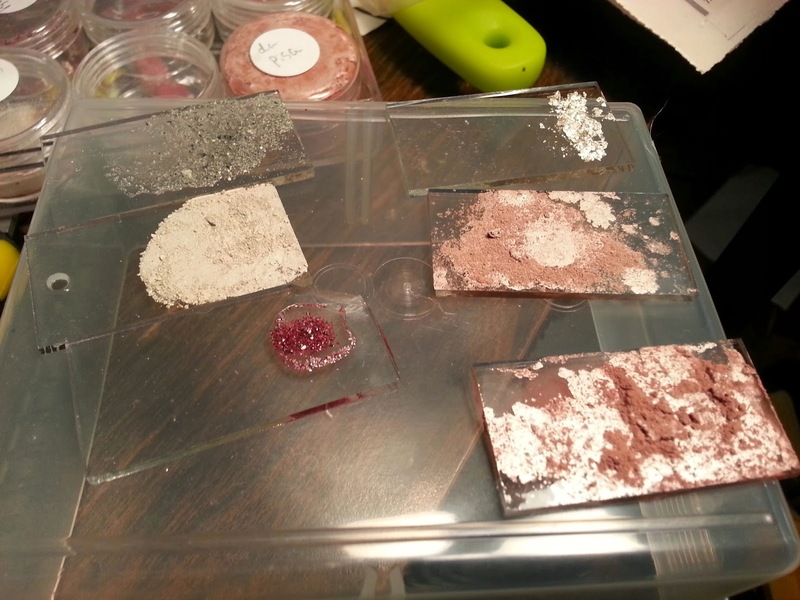 The new stuff is more like the color of "Imperial porphyry" and it arrived in rough chunks that do grind quite well. 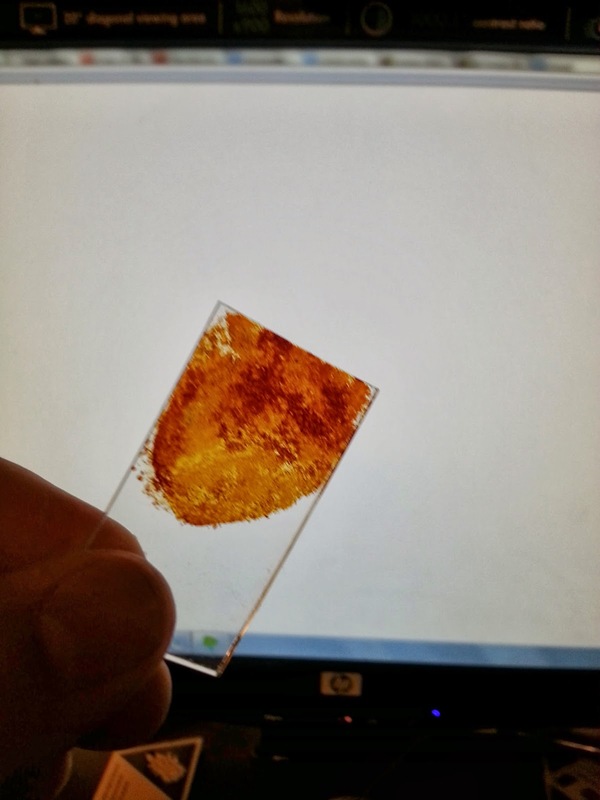 Finally, an update on my silver stain research. I'm entering this into A&S, and have enough information and pictures to make a worthwhile blog post. I'll skip the long train of how I found my sources, following reference to reference until I narrowed them down. I found seven recipes for silver stains. One ended up being a poor translation of another. One was incredibly complicated and is intended as a ceramics glaze; while the recipe would probably work on glass, I really can't call it a glass stain. This is a compilation of recipes for a tremendous variety of crafts. The core of the text was compiled around 600 AD. Versions have been found from 800, 1130s, 1200s, and a variety of fragments of the text. "For staining [glass] sapphire, silver and sulphur should be set on fire together; afterwards from 2 pounds of clear mosaic glass and 3 ounces of the above-mentioned sapphire cooked together, you will make jacinth stones." I initially missed this when I read my copy of Mappae. I didn't want blue glass. 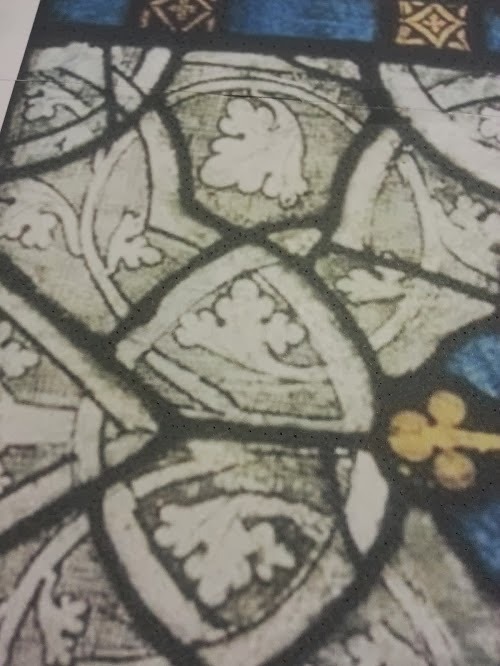 It wasn't until I read "European Stained Glass Around 1300 - The Introduction of Silver Stain" in which Meredith Lillich explains that in period people knew "sapphires" to be both blue and orange varieties of the same stone. Although this appears to be a recipe for a pot metal orange she provides a compelling argument that it may have been used as a stain, and that the furnaces available at the time were capable of reaching the appropriate temperatures. I purchased a few small vials of powdered silver for my experiments. I also bought 2 pounds of 99.5% pure sulfur prills (pellets), apparently used for livestock typically. I ground the sulfur to a powder in my mortar and pestle. In the absence of proportions, I mixed them equally. I wasn't sure what "set on fire together" should mean precisely. I put them in a pan I was planning on throwing away anyway, and set them on low heat. Holy cow! The sulfur melted quickly and the whole thing became a black tar-like mess. 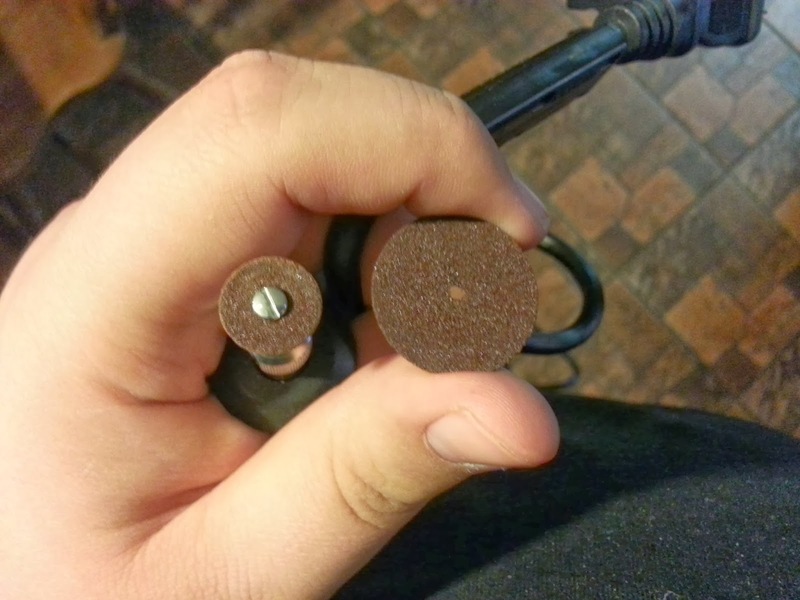 I couldn't figure out precisely how I was to use it, and decided I would grind it back into a powder. I believe the sulfur and silver are reacting to create silver sulfate. I'm not sure what reaction would happen alone that couldn't happen in the kiln, so I went ahead and made a second sample that would not be heated until in the kiln. In my previous post I tested pure silver sulfate and the effects were apparent, but not this strong! Slide 1: "cooked" MC formula. Slide 2: "raw" MC formula. Fired to 1000 degrees. A closeup of the "raw" MC formula, 1000 degrees. This formula created a beautiful orange stain, exactly as the formula described and Lillich predicted. I believe the irregular coloring has more to do with my crude preparation than with the mix itself. The Lapidario is the text by which Lillich (and Ken Leap, possibly from her research) speculate that silver stain truly became known in the West. It is a text describing stones and astrological properties. Lillich explains that the names given are incorrect and explains this is actually the city Guadalajara. She identifies the stone as silver antimony sulfide, or pyrargyrite (Ag3SbS3). This is known as red silver. Further research on my part shows that this is not the exclusive mineral source. 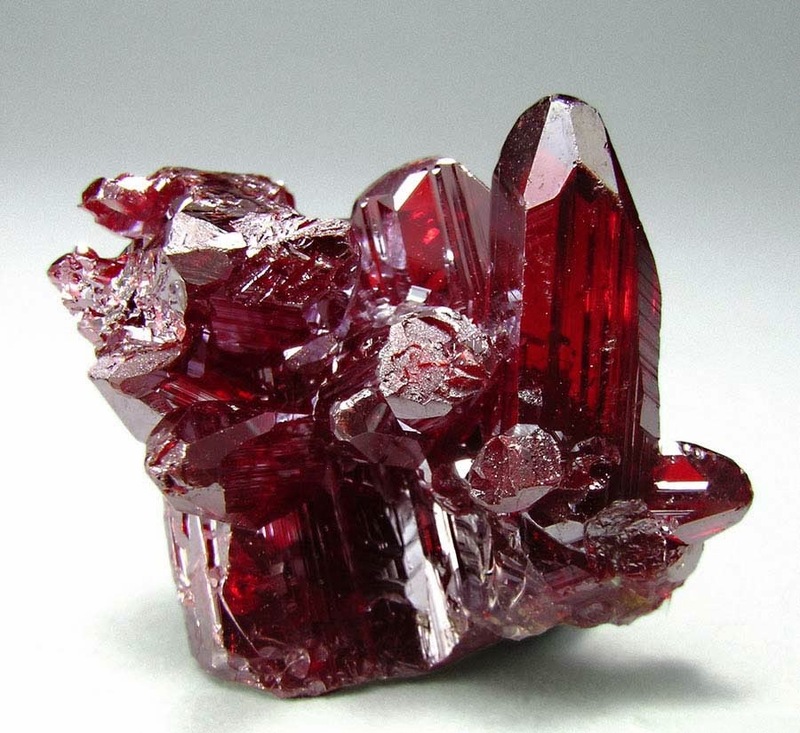 Proustite is a mineral that is visually indistinguishable from pyrarygyrite. They are isomorphous, meaning they have the same crystalline structure and essential composition. The difference is that where pyrargyrite has antimony, proustite has arsenic. The test needed to distinguish the two substances was not developed until 200 years post period. 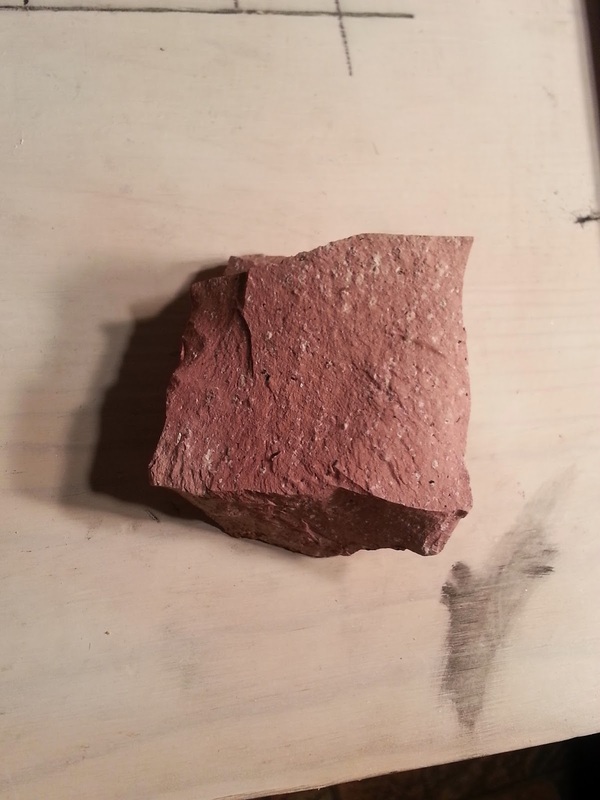 I purchased samples of both rocks. Further research and pleading from friends turned up that antimony is much safer to powder and heat up. Even though I was using tiny amounts of the mineral and it was VERY unlikely to be dangerous, I used proustite for my test. Slide 3: Lapidario formula featuring proustite, fired to 1000 degrees. "If you wish to make a beautiful yellow colour which may penetrate into the glass, grind some silver leaf with a little honey and water, that it may hold together; then wash it in water with the fingers until it is well purified, in the same manner as powdered gold is treated. Distemper this silver with gum water made with soft water, dry it, then heat it in a furnace as before, and it will become very beautiful, &c"
I took silver leaf and tore it up a bit before starting to grind it in my mortar and pestle. My initial thought is that the honey is there to help give the leaf some body and grind it up. It makes sense that you would then wash it off. 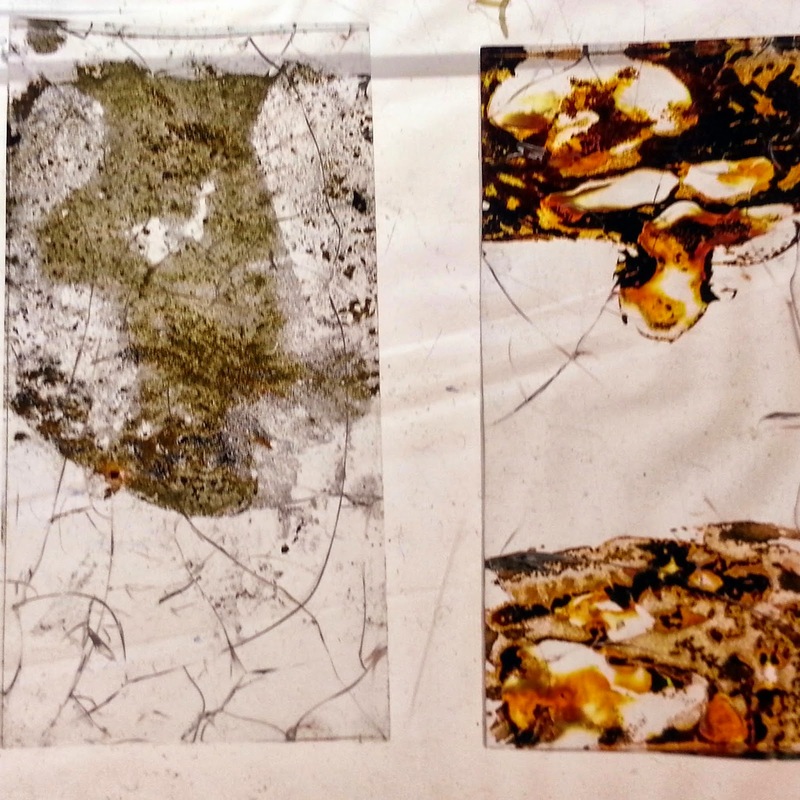 I used gum arabic and water to apply it to the slide. The initial slide with this formula, fired to 1000, came back clean. The silver did nothing. Slide 4: Marciana formula, fired to 1000. Aka, clean slide! I had similar difficulties with the last two slides, and decided to try again. I fired them to 1300 degrees. It definitely stained, you can see the pretty yellow color in the picture (that's pure silver leaf underneath, not gold leaf). Unfortunately at this temperature the silver leaf fused to the glass and I haven't been able to remove it. So, I tried again, at 1150 degrees. The silver didn't stain. I may continue to try and get this to work with this glass. It MAY end up being that this glass gets soft at too low a temperature for any other result, however. I won't waste much more of my materials chasing it down with this particular glass, though. It appears when it works it will be a beautiful pale yellow. ""The yellow is made with silver, copper, and a little yellow ochre, the whole ground up together on a plate of copper."" Hah. Easy. HAHAHA. Foolish glass geek. This formula is the second slide in both of the two preceding pictures. You will notice it makes a beautiful color as well. 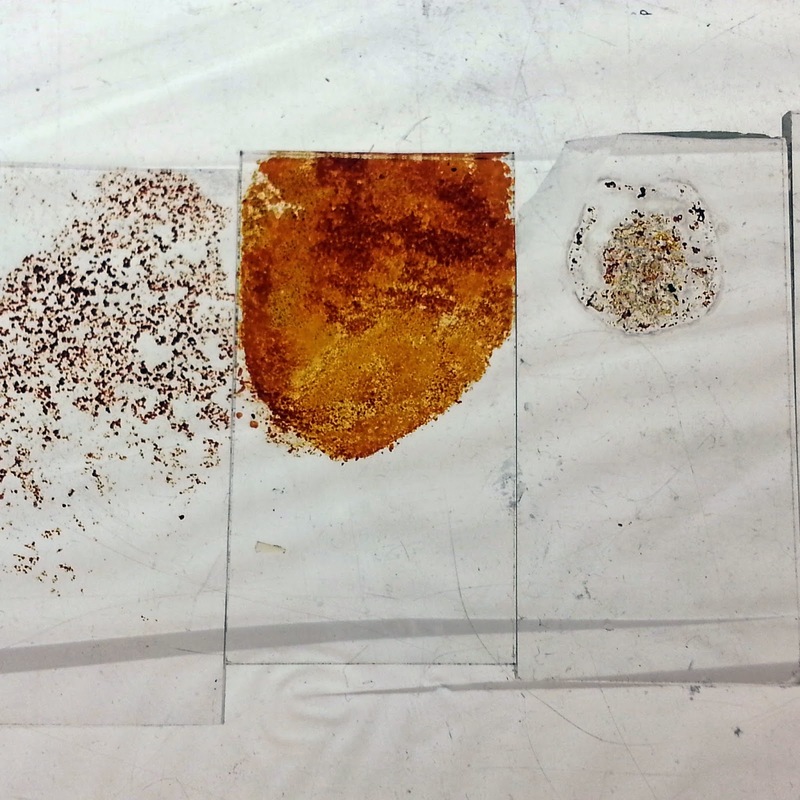 Unfortunately the minerals fused to the glass in most of my samples. Bottom center: Brussels at 1150. Above it, Brussels at 1300. Center/slide 5: Brussels at 1000. Clearly staining the edges! This stain is proven to work, but I'm having difficulty getting the mineral residue to come off the glass. Lower temperatures for longer time makes sense, seems to be how it would have been done in period (they certainly didn't have an electronic controller on an electric kiln!) 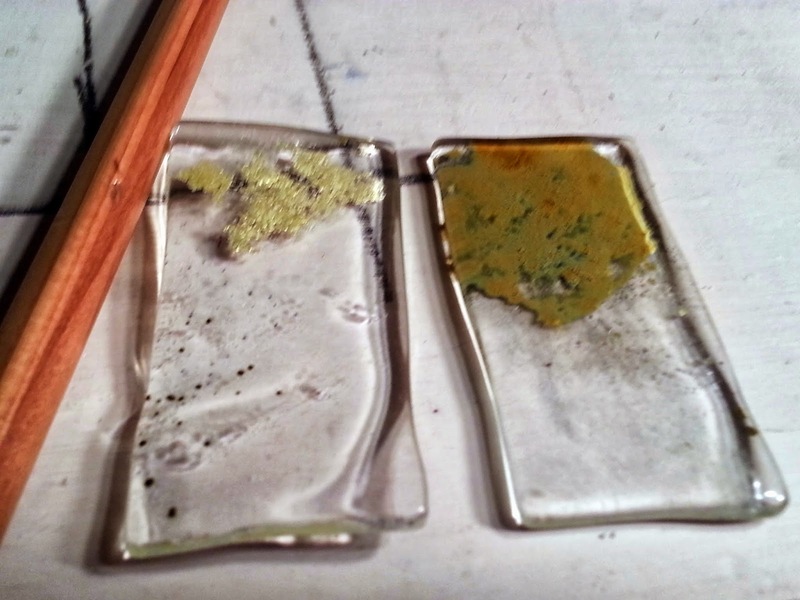 That should allow the stain to set in the glass without the glass getting to tack fusing temperatures. 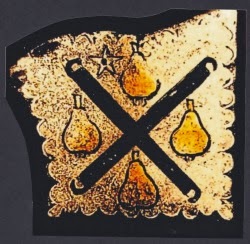 To get the yellow color, take the fine filings of money, that is to say, the Venetian money and grind this on a chip of porphyry, until it is fluid like water, then when you begin to paint, apply it on the white glass where you want it to become yellow, and mix it in the least with the liquid egg tempera." A great many painters are smacking themselves and saying "Well, duh." Some Venetian coins had much higher ratios of silver. Because of that I doped the mix with more silver. In the picture above the top compound has considerably more silver than the one below. Knowing that the visual differences might not be as obvious after firing, I wrote an "L" ("lower") into the original mix. Unfortunately, as with the preceding two, I had issues getting this to fire at a temperature that didn't fuse the metals to the glass. BUT, it DID stain! My six samples, drying before being fired. All six of the period formulas worked as a silver stain. 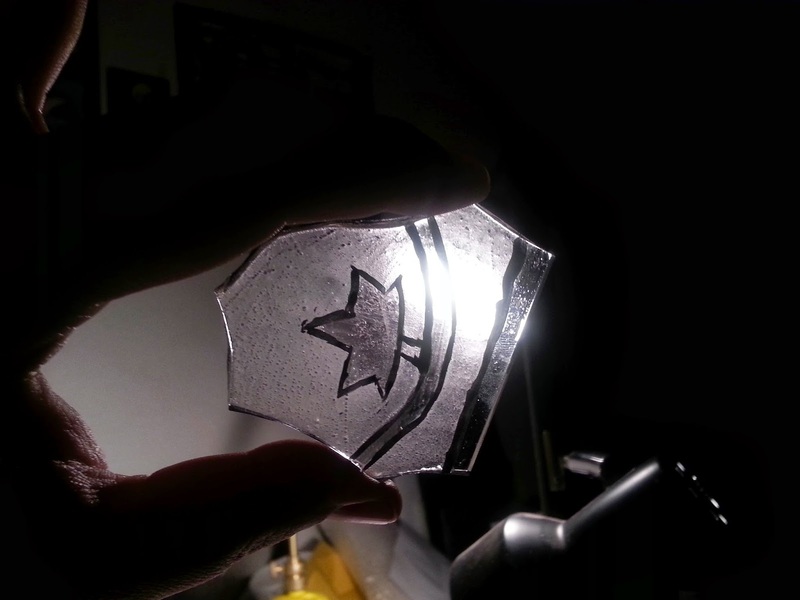 This particular glass made it difficult to show some of them in all of their glory, however. Interestingly, to me, the earlier formulas (Lapidario, Mappae) were the easiest. They make or use silver salts which, if I understand Leap correctly, fire at a lower temperature. The later period mixes (Marciana, Brussels, da Pisa) rely on actual metallic silver and are more complicated. However, I think they give a yellow color instead of the orange/ambers of the earlier mixes. Many glass recipes I see suggest a methodology of long slow cooking which would be impractical in my electric kiln but make sense in a clay and wood-fired oven. That may help the later period formulas. 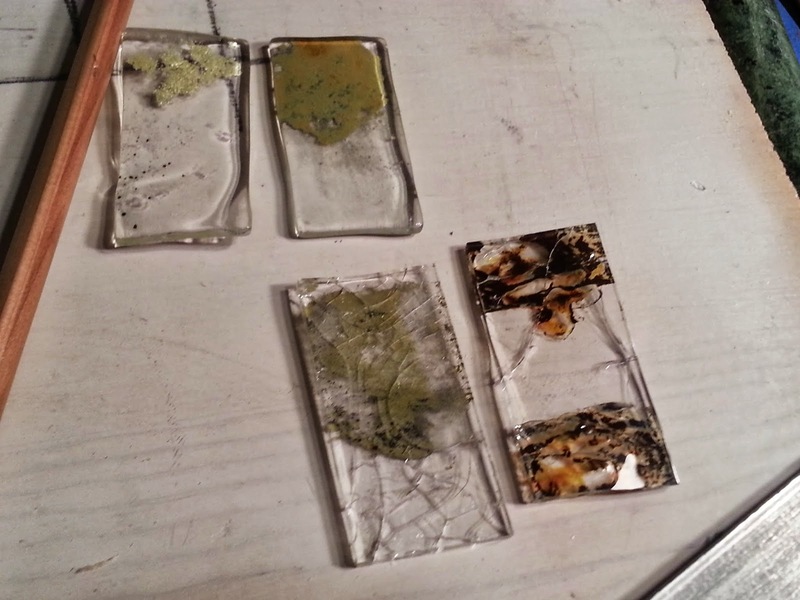 I would love to try some test slides if I ever have access to, or make, a period glass kiln. Something I am mildly considering at Pennsic this year. "antimony sulfide and silver in a liquid suspension, diluted 1 part to 6-10 parts by some form of clay (brick dust, ochres, etc)"
Antimony sulfide is called stibnite. I believe this has been confused with pyrargyrite, however Husband didn't cite that passage or explain the source. Later in the chapter, however, he cites a translation of the Lapidario, suggesting that might be the source of his recipe as well. Antimony sulfide and silver is, essentially, pyrargyrite. I purchased a sample of stibite initially, before I read Lillich's text on silver stain. I may still try "stibnite and silver" in the future. It may be after A&S season, but I am going to continue to work on these formulas, probably with other glasses and temperatures and with finer grinding of some of the minerals. I am pleased to know, however, that I have an immediately workable orange stain that is BEAUTIFUL and that I can give out at my silver stain class at Pennsic this year. This is going to be an intentionally massive post. I'm going to list all of my medieval glass-related books and a quick summary of why I find them useful (or not). I may have a future update on my modern glass-related books, too. This book focuses on the who, the why, the where, and a little bit of how. It details the information we have on glass painters as people, who hired them, some of the prices that are recorded in church financial records. We get the names of some of the known glass painters and how they learned their craft. 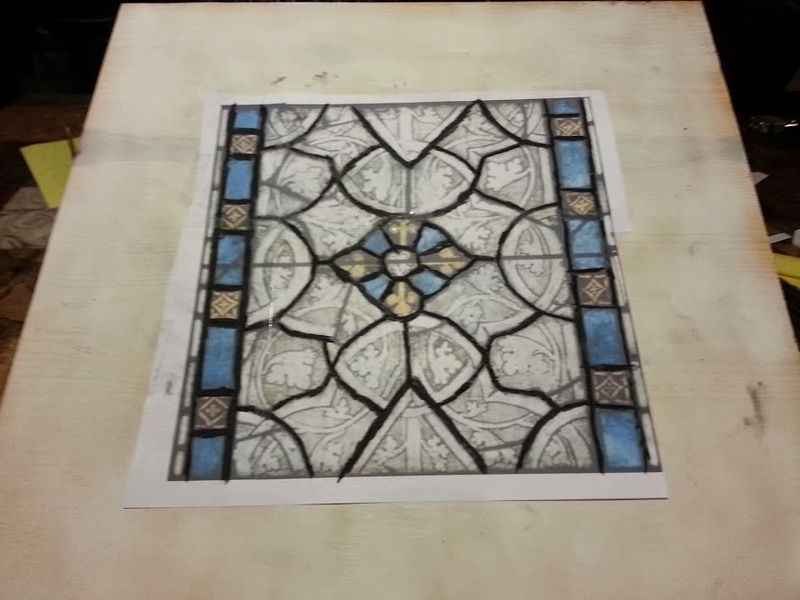 There is a chapter detailing the procedues of making a medieval glass window as well. I found my copy for cheap at the now-closed bookstore at Bristol (Ren Faire) and misplaced it. I liked it well enough to pay twice as much for a copy off of Amazon. The book concentrates information I've not found in other places, or only found in snippets elsewhere. One of only two books I intend to break my scale for. If you want to learn about glass painting, this is your book. I have an older hardback copy I got used, but it recently got republished in paperback format with a DVD. Elskus covers technique, tools, materials, provided color shots of paint comparisons, detailed notes about a number of paints, binders, mediums, and step-by-step instructions of a few projects. This is a must have, especially since you no longer need to pay hundreds for a coveted copy. The DVD was useful, but the narration... a bit dated. It sounds like it was narrated in the 1970s. This is a small paperback detailing British stained glass from the 8th century through the present. It is wonderfully illustrated with full-color photos. It's only real downside is it's a niche book; If you aren't trying to research British glass, it's of limited value to you. This is one of our primary sources and is pretty much a must-have. Theophilus wrote it ~early 12th century and covers making and making glass, the pigments, the leads, etc. This is another primary source, and as such is probably a must-have. It was written much later than On Divers Arts, and does not cover the subject of glass work in nearly as much detail. Still, primary sources are good to have. A third primary source, and must have. Cennini talks about all manner of glass techniques, making paint brushes, etc. Couldn't decide if it was a 3 or a 4. From his website and research notes I rather suspect Leap is a SCAdian. I know he has SCAdian friends and that he teaches a class on medieval glass techniques, but I've not found him mentioned in what should be his Kingdom and didn't want to e-mail him to ask. I love this book. 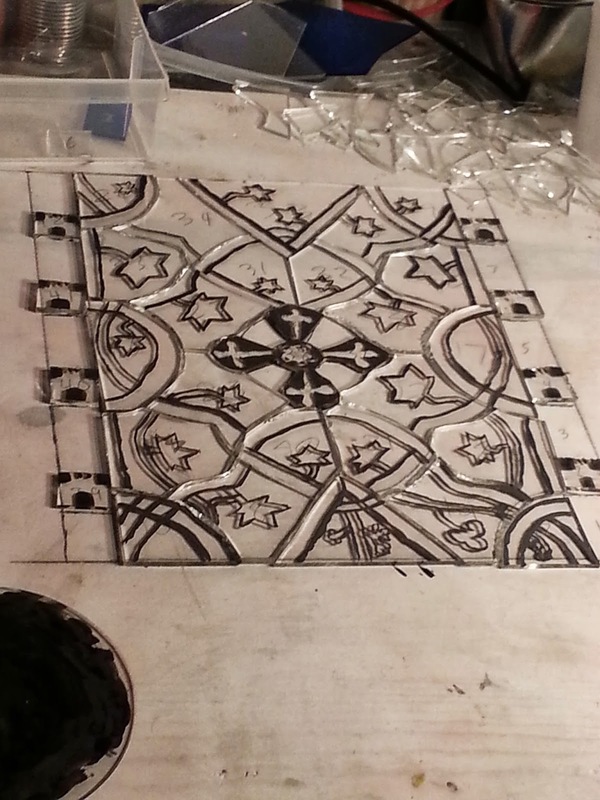 He details the history (and led me to finding my primary sources on silver stain), composition, and a variety of techniques for silver staining glass. He also tested a wide variety of stains, on a wide variety of glasses, in a number of schedules, and includes photos of the results. This book has a few pages of relevance to a glass painter. I was provided photocopies but the copies didn't explain the dates and significance of the manuscripts they came from. A copy of the book, containing both volumes, was cheap enough I grabbed it. My primary interest in this was for a period silver stain formula. Unless you are heavily researching silver stain or making your own pigments, you will not likely get significant value from this book. Even then, I'd recommend an hour at the library rather than taking up six inches of shelf space with the book. Now, if you also enjoy scribal arts or traditional painting (or want to share with a friend), this is probably a hell of a purchase! 2/5 (niche), 3/5 for "European..." and "Studies in..."
Everything Prof. Lillich writes is AMAZING and dense with information. Unfortunately they are each focused on specific times and locations (I probably shouldn't say 'unfortunately' as they've provided me WEEKS of study). If one her books covers the time/location you are interested in, it will be invaluable. If not, no sense in ordering it. These are academic books; they have pictures but not many and not many in color. 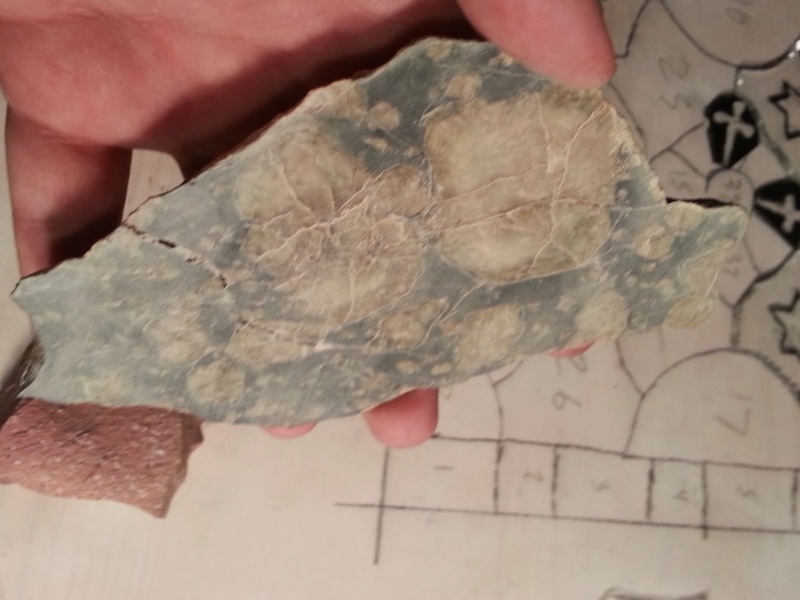 You will get very rich detail about the designs and considerations for the given geotemporal locale. This book has exactly one page about the stained glass of the cathedral, and the process is so over-simplified it is incorrect. I received it for Christmas, and while it may be useful for other information on the cathedrals of yore, if you are looking for a glass resource this isn't it. This is a pretty interesting book. It has some beautiful full color pictures and good black and whites too. The book features a collection of medieval glass and statuary collected for inspiration during the building of a modern church. The book has a good selection of stained glass in it with a variety of historical tidbits. All featured pieces are between 1100 and 1300, European. An excellent visual resource. This book features glass from 1140 to 1540, with large full color photographs. It's not confined to one country, either. I definitely recommend it. Like the Lillich texts above, these are 5/5 if you are interested in the specific subject matter. Painton Cowen, who also runs THIS AMAZING SITE WITH 25,000 PHOTOS OF MEDIEVAL STAINED GLASS sorted by place, time, theme, etc, wrote some good books. Rose Windows is a bit dated, being printed in 1990, only because of the quality of the photography. English Stained Glass, which has been key for some of my class research, is from an age of better photography. As a side note, Painton graciously answered my e-mails asking about Spanish glass and pointing out a broken link on his site. I didn't put 2 and 2 together until the next day when my copy of ESG arrived and I thought "Hey, someone else with that unusual first na--- OHHHHH"
An excellent resource giving a European-wide overview of glass for a thousand years. She discusses innovations and trends and I've gotten a great deal out of this book. Another great overall reference. 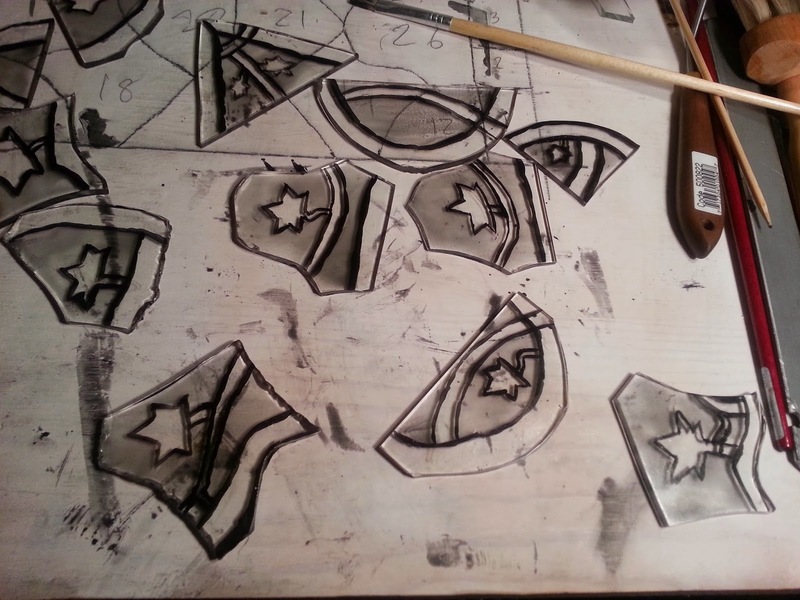 Armitage discusses glass making, kilns, painting, acid etching, heraldry, and a great deal else. It's a little bit dated, but I've gotten good enjoyment out of reading it. 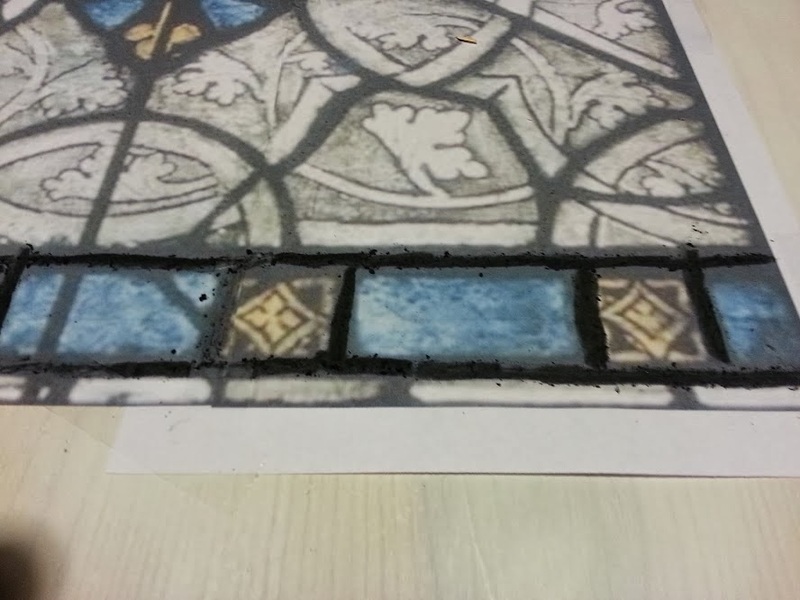 It's not particularly focused on medieval glass, however, knocking a point off the score. A great book for late period roundels, if you are a skilled artist already. Late period glass was basically treated like a canvas, with elaborate images painted onto sheets of glass (often, not always). This book features beautiful pictures of such roundels. 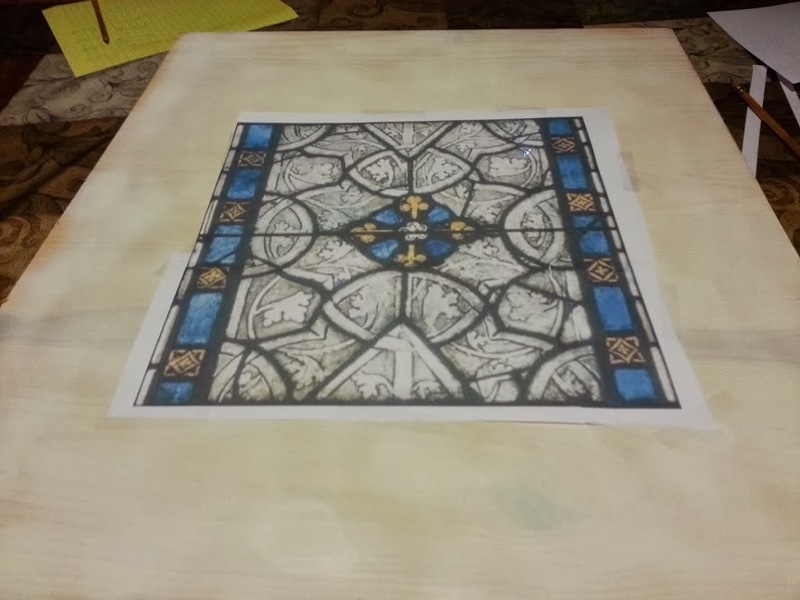 Personally, I am not a skilled freehand painter, and this style is completely against my personal taste/style (even outside of an SCA context). I bought this, frankly, because it was mentioned in Mistress Kirsten's docs when I first started out. It was amongst my first few purchases. Later it held my interest again for it's mention of silver stain, but that information is (I believe) wrong. My later research and other sources mean this isn't a book I go to for much at all. If you want to do late period glass painting, however, get this! This book was a lovely gift from a dear friend during a dark time. It is very small, and as such has small pictures of 19 panels or pieces at Chartres, with some other information. I cherish the book, but not for it's text and photos. This is a fascinating text, and contains a silver stain recipe amongst many other recipes for pot metal glass colors. It would be of more interest to a glassblower, but it contains recipes for all variety of inks, foods, paints, poisons, etc, etc. giving it great appeal to SCAdians in general. My gratitude to Master Ali ("Arab boy") for refering me to this text. 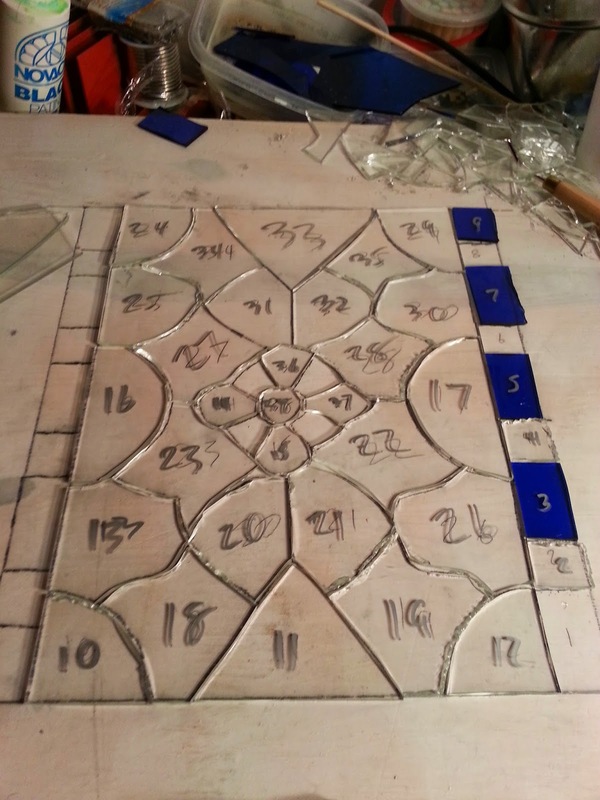 An excellent overall view of the stained glass process, written by a SCAdian. I strongly recommend it. 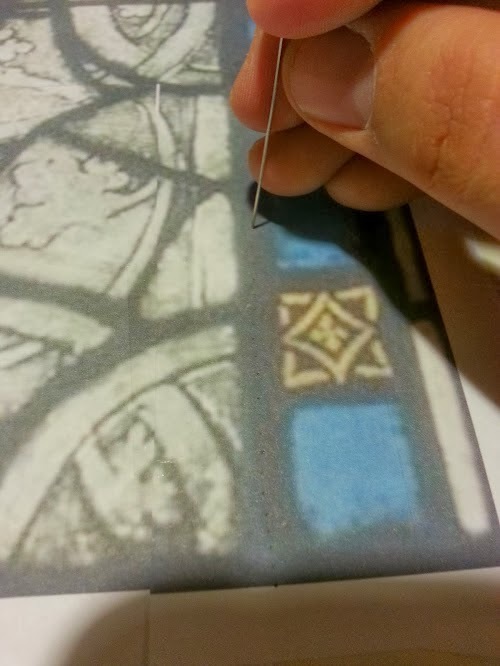 This is a fascinating read, and has some information on medieval glass guilds. I got it because of my interest in glass painters and makers in the context of society; if you don't share the same interest, it may not be useful to you. Very similar to A Thousand Years of Stained Glass, above, though the specific pictures selected are different. It's still a good grab. If you already own one, the other won't provide leaps and bounds more information, but they are complementary. A recent and excellent book, Raguin shows up close pictures of glass to reveal a few secrets of construction, includes images in other mediums of glass artists at work (showing what late period tools looked like, how the workshop was arranged), and beautiful color photographs. She talks about the different places stained glass windows were installed (Cathedral vs. parish church vs. homes and secular sites), patronage and the business of medieval glass, etc. Good, good book. A very neat set of translations, but there is almost nothing of use to a stained glass artisan. If you want a primary source for glassblowers, here are your books! I have some minor training as a glassblower and was interested in the books out of curiosity, but not for flat glass. 5/5, if you can get it. Run away. An impulse buy of a cheap copy at a renfaire book store. Its a tiny book with nothing but pictures of glass windows and bible passages. Of no academic or practical use whatsoever. I will likely give mine to a religious relative some day. I've got my "table" on an actual table. It's a lot more difficult to get a good cutting/viewing angle when you can't manipulate the paper cartoon or walk around the table. Doing this on a freestanding table would be more interesting. Also, glass shards get stuck in the wood. That was a delightful surprise! Brush away all you want, you're probably going to need tweezers. 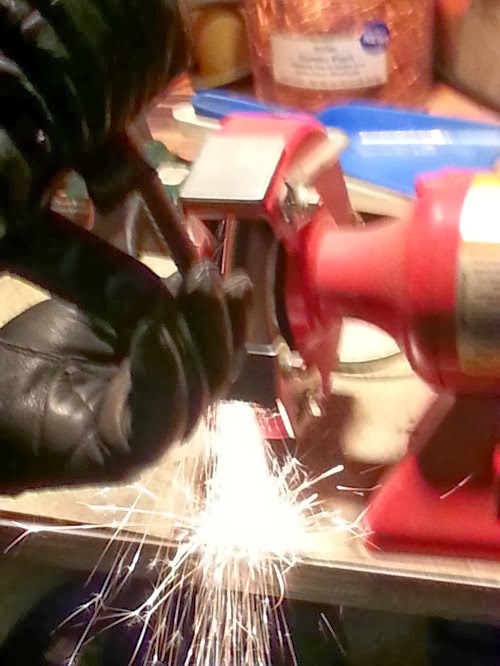 Using a grozing iron kicks up glass dust. My research (as a nonmedical professional!) indicates silicosis is only a factor after prolonged exposure to large amounts of dust. I still might get a cheapy medical mask, I felt like my nose was a bit irritated. When I'm done with my dividing iron for an extended period, I quench the end in the goblet of water on my bench. Then I set it on a chunk of framing stock scrap that serves as an excellent stand, protecting my table or the pattern table. A rather subjective observation, but it seems like this glass cuts so much cleaner. Harder to make shelves in it when cutting straight lines. Very nice to work with! Today I learned I was way off base about the use of the grozing iron. I'm a little embarrassed to write this, but this blog is a place for me to track my findings, sources, projects, etc. I know others read it, and I link others here when something I've found may help them... but at its core it's my own record keeping. So, today I learned that the grozing iron is not grozing pliers in a different shape. It wasn't just the name that led me to think this, but a slight underestimation of the tool's capabilities. I understand and understood that the dividing iron acted as a glass cutter and running pliers in one; it creates a score that runs pretty much simultaneously. I thought that the grozing iron must be there for lines that don't quite break, or for glass that is leftover on a breakline. I tested the tool that way, running a score and confirming that, yes, it breaks the score. However, that's not what gives period glass it's distinctive chewed appearance, and not why the tool is described as nibbling glass. 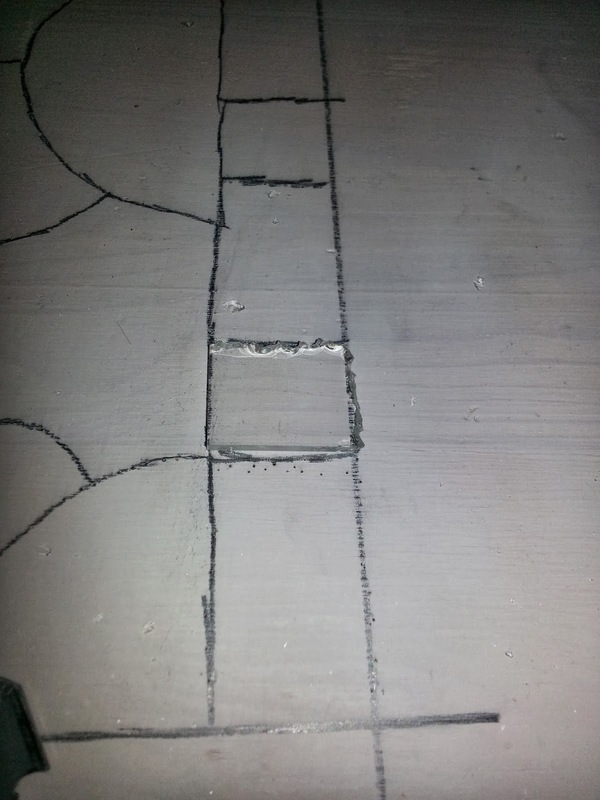 Tonight I cut a few pieces of my panel with the dividing iron and noticed I could only cut some general shapes out, not the exact pieces I planned. I reviewed some notes, sources, and reconstructions from a tourist attraction in the UK and suddenly it clicked. You are literally chipping away little bits of glass with the grozing iron. It uses brute force to chew bites off the glass, a description that suddenly seems a lot more on the nose when you are looking at all these tiny semi-circles taken out of an edge. I was also surprised to find that the tool is quite versatile. I can tear off large chunks indiscriminately, and I can also scrape slivers off. So, today I cut most of one blue/gold border. According to the museum notes these panels were silver stained. It looks rather even and its the entire piece in all of these borders, so I assumed it would be pot metal yellow. I'm trusting the experts, however, that these were stained. 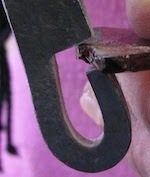 The picture above shows a side effect of using a dividing iron; There is a lot of uncontrolled cutting and breakage. Unfortunately it is very difficult to get the blue GNA glass I'm using here, and the clear mouth blown is expensive. I don't think I'm going to be able to maintain my goal of extensive period cutting. I will use it whenever I can, but I'm already accepting the fact I will have to use my modern cutter in many places just to avoid wasting hundreds of dollars of glass, some of which I can't even replace if I have to. 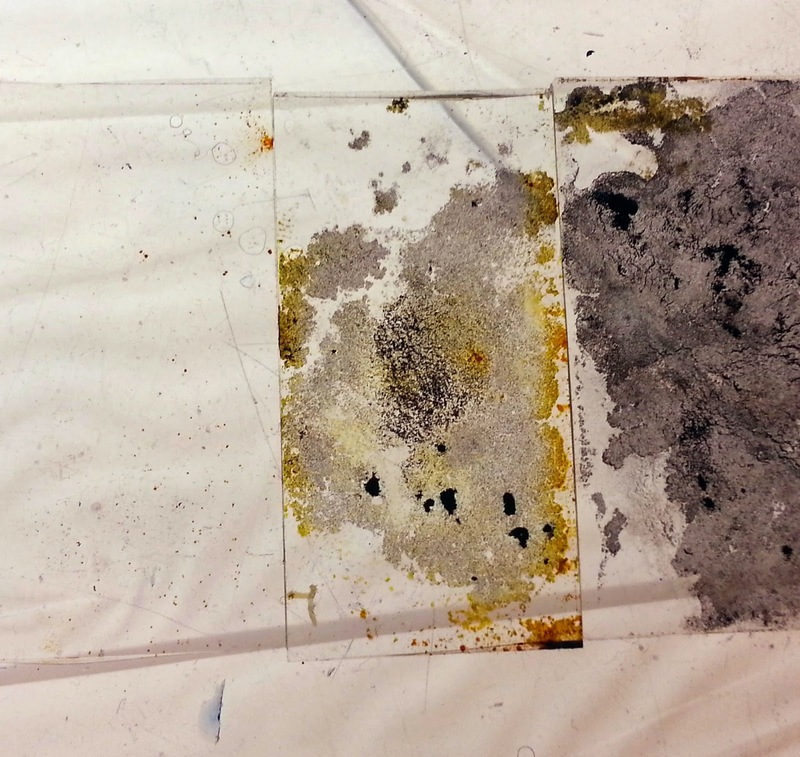 I'm saving the little pieces on the corner of the table to potentially make a small batch of vitreous paint. I have a late period formula that calls for iron shavings, which I have on hand. It will make for a fun little experiment. I don't have to worry so much about incompatibility if I am using the same base glass... I hope! All in all today I got a first true appreciation for the work of a medieval glazier. I am making a 1 square foot scaled down version of a segment that would have been 4 square feet. If I do the math, and if memory serves, the entire window would have been 36 square feet. It was one of 5 windows in that portion of the church. One of several dozen windows in that cathedral. And they made it with a hot iron rod and a bar with a notch in it, in essence. The enormity of it boggles my mind. They could do so much with so little in the middle ages. Now that I think I have all of my materials and tools gathered, it's time to get to work! I will try to add notations and sources later. 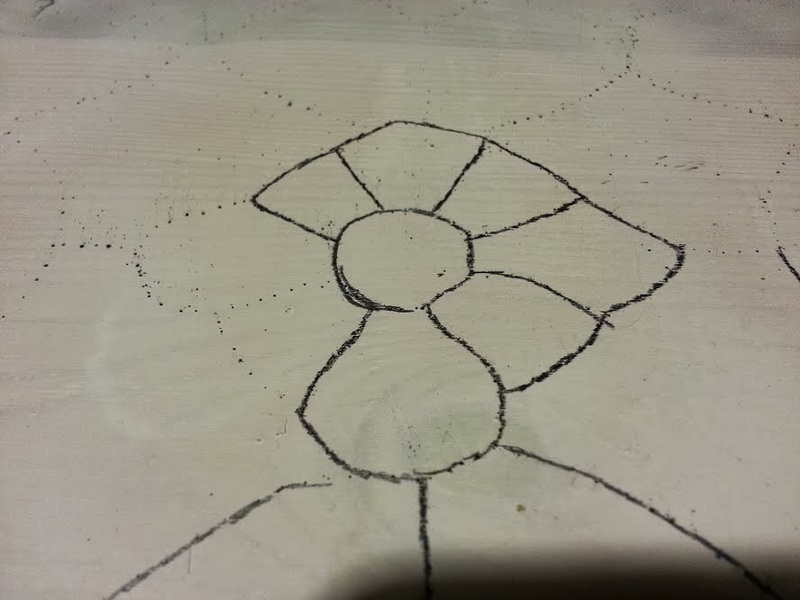 From my research, the glass artist worked from a "table" that was whitewashed, and the pattern drawn directly on it. 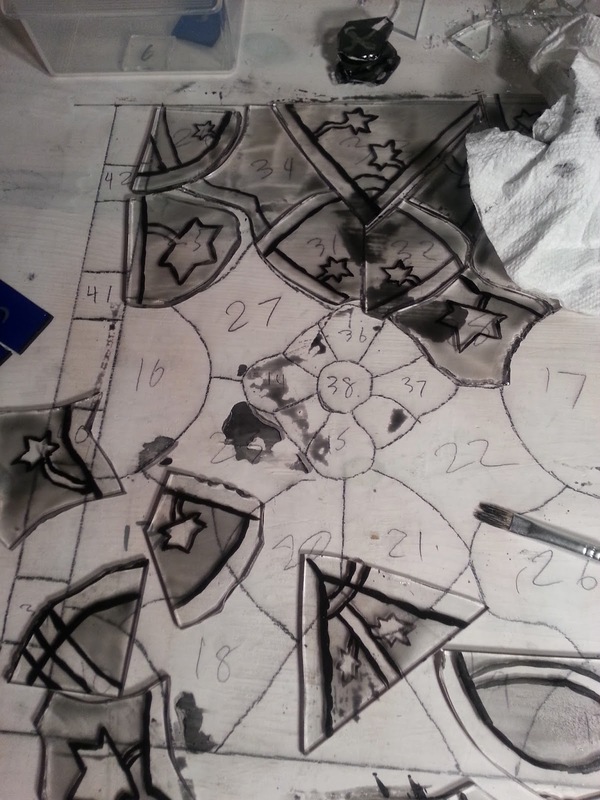 There are financial records showing the glazier hiring artists to draw their pattern onto the table for them. I do have a sister-in-law who is a professional artist, but rather than bother her, I decided to trace the design I want onto the board. But, I wanted to do it in a period manner too. I started with a large board I had around the house. I white washed it and placed it on my dining table to begin working. It was inspected and improved by Scheherazade ("Zod"), my cat. This was both more and less tedious than I expected. Right when I reached a point where I really thought unkind things, I also realized I was finished with the pin. 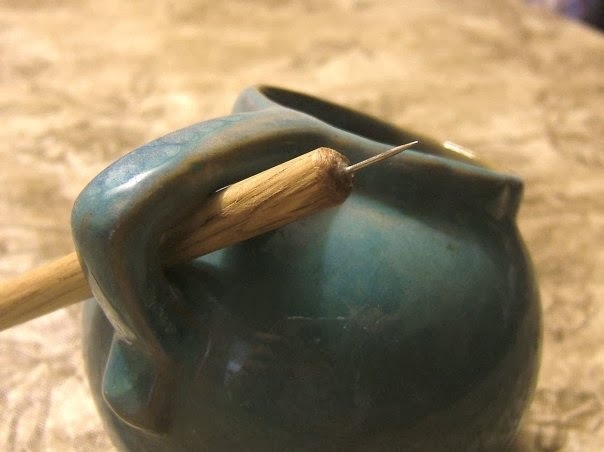 It hurt my hand quite a bit, pushing that pin into wood. The thought occurred to me it might be easier to have a handmade pin like what Roana or Ercc makes. They are a bit larger and I suspect stronger. Sometimes this pin was bending more than I was comfortable with as I pushed. I imagined it snapping and going into my finger (been there, done that). Fortunately, it didn't. As promised, the dots and charcoal were left behind on the board. The traced cutline looked a bit irregular. On further exam... the original panel was irregular. No problem there, then! I removed the background nose of the "How It's Made" marathon and replaced it with something a little more.... on topic. Before anyone asks, the white material on the rod is from absent-mindedly setting a blackhot iron onto the pattern table. It burned and picked up some paint. Since I demonstrated the dividing iron on tape, I decided to do a quick video of the grozing iron too. 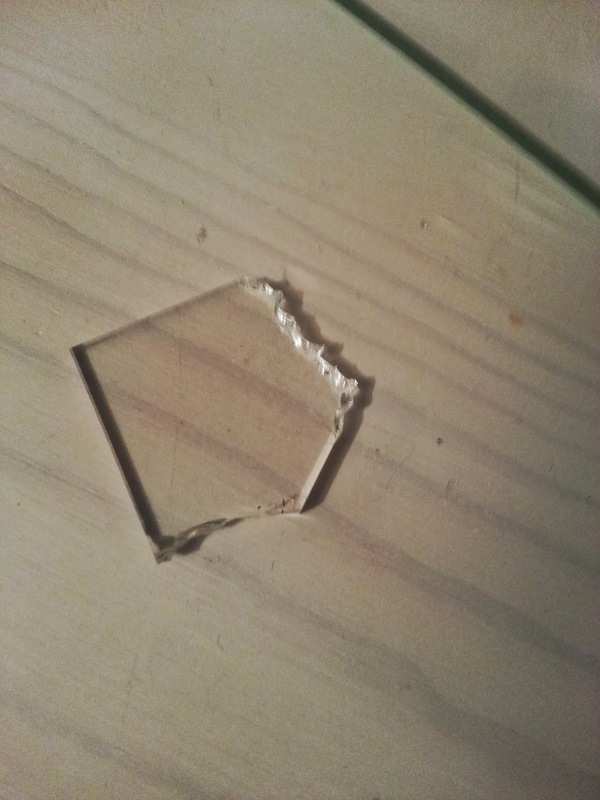 I had a segment of glass that I scored but which was not cleanly broken. The grozing iron takes it right off. I didn't have any clever music for this one, so you get 23 seconds of How It's Made. Don't forget the emery point path! I shall find out today how different that makes the process. As I already knew, a larger dividing iron will hold more heat and make this process easier with it's extended working time. That will be rectified later! I had some trouble when I tried making my first minever paint brush. I researched it a bit more and discovered two things: The first set of quills I had purchased were mutants and had been cut short by the vendor and second, people working with quills usually soak them to make them softer. Now, to be clear, in the directions on p. 40 of my copy of Cennini he doesn't say to soak the quills. His thread may have been stronger, his quills thinner-walled, or many other things. However it looks like fly-fishers and others using these quills today frequently soak them, so I gave that a try. That made the quills softer and suddenly able to take a bit of a "squeeze" that broke my thread with the first try. Not wanting to waste my precious supplies of stoat tails, I decided to try again using hogs-bristle (the other type of brush described by Cennini). A feather from the first set (top) next to one from the second set. I hadn't realized the feather should have this chiseled tip the top one has. Comparatively the second set also have much more usable quill. The process is pretty much exactly as described in the previous post. 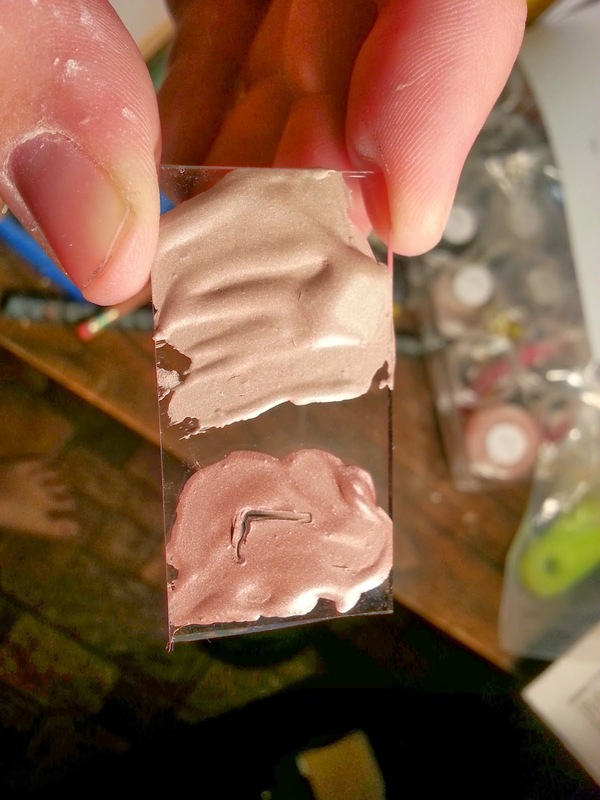 I have a pack of hog-bristle brushes that I bought for scrubs in my glass painting. I took an exceptionally large one for which I had a duplicate and took it apart to claim the bristles. An interesting observation, the bristles have a "root" end. I'm not sure it's biolgically/cosmetically a "root" but one end will be thicker and stronger on a good bristle (I also don't know why these are bristles and not hairs, but I'm a glazier-turned-brushmaker not a biologist... yet). 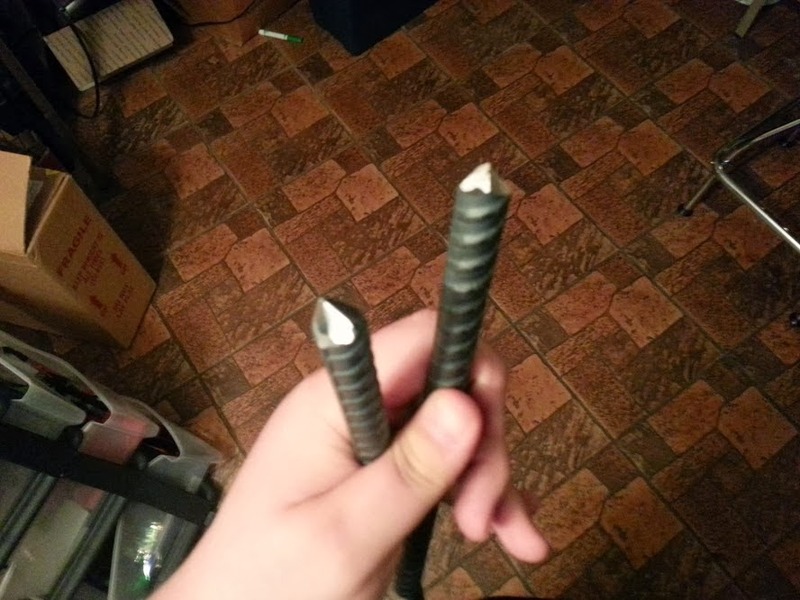 I found it important to try and line up the bristles so I knew which end was the thicker/stronger end. I took my soaked quill and trimmed the very end off. I used a tapered stick "of other good wood" as Cennini calls for, and shoved the quill on as far as possible. I then grabbed a clump of bristles and shoved them in the other end. Cennini described sticking bristles/hairs in individually until you can't get any more of them. This is where it became a LOT easier to know which was the strong end, as that end wiggles in more easily. This also makes some sense for retention purposes, I think. The portion of the bristles that is at the opening of the quill is somewhat thinner. You can sneak more bristles in. If you were to try and pull the bristles collectively, however, I think the thicker ends would jam and not come out in a clump. 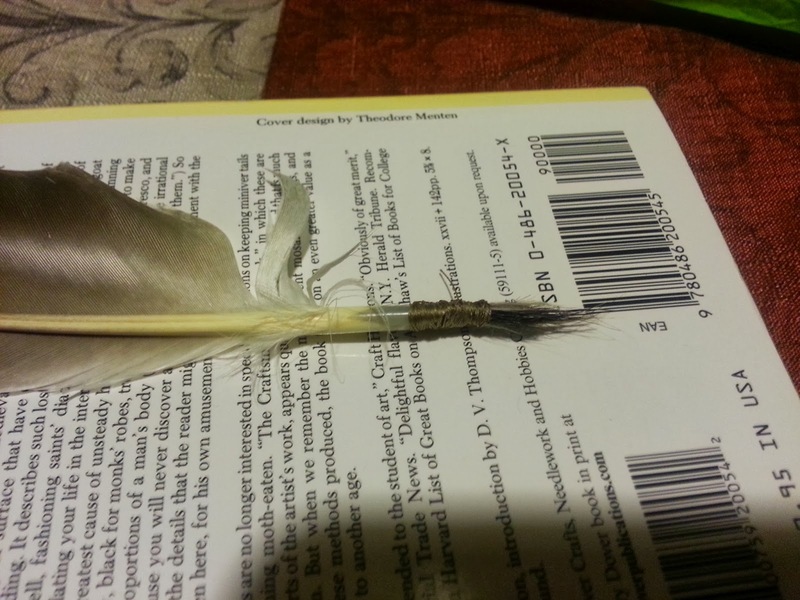 I tied a knot with my waxed silk thread and could see the quill took the pressure a little better. My thread snapped, after I had gotten the knot tied. On a lark, taking a note from an old martial arts movie that "wet silk never breaks" (not true!) I soaked the thread. 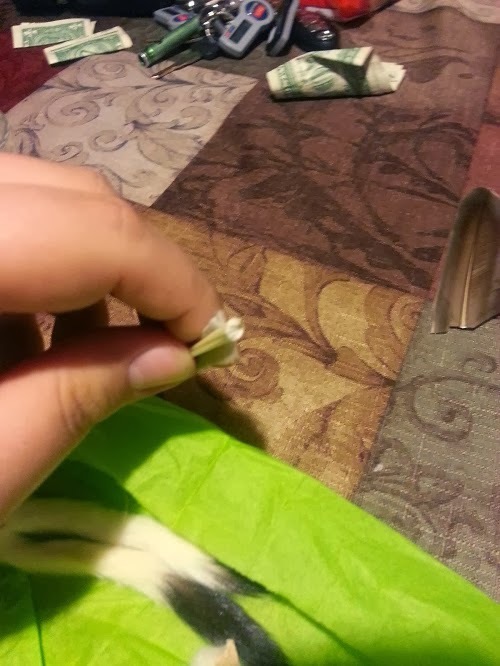 I continued tying another knot and doing a little wrapping (that was probably too loose). Its difficult to do all this with only two hands! Same thread, knot, wrapping on the other end to secure it to the stick. As a final step I dunked it back into water and made some practice strokes. I gently tried pulling the bristles and none came out. I wouldn't give them a serious tug, but I think this is a practical brush made exactly to the primary source's standards. We will see if it holds up to vitreous paint and silver stain, however! 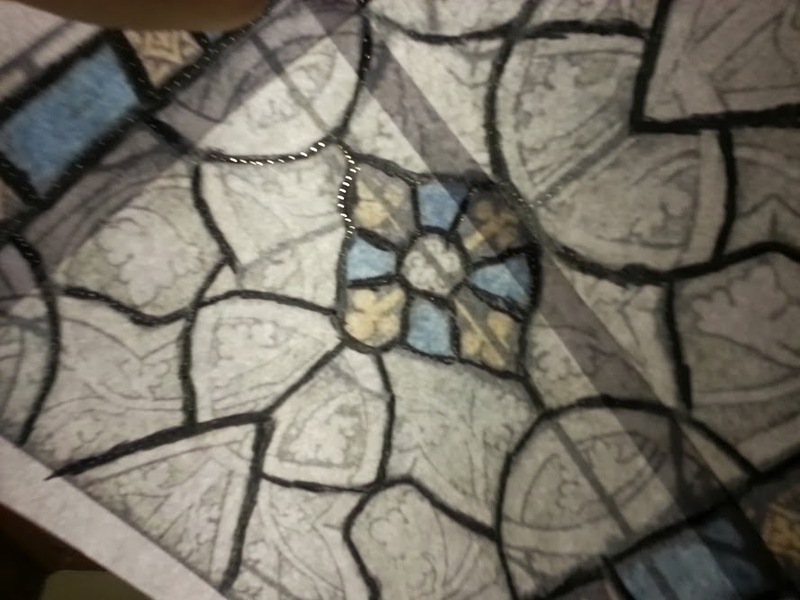 When I teach my silver stain glass this Pennsic, I hope to give out small vials of stain. I'd love to make a dozen of these to give out too. It didn't take too long in the scheme of things and would be a nice touch! Hog bristles are much more clingy than stoat fur. When I dunked my bunches of bristles in water they immediately made a tight cluster. I had to work the fur with my fingers for a while to try and make a cohesive bundle. I think in general bristle brushes are going to be easier to make than stoat. I'm not sure why soaking a hard protein-based quill makes it softer, but don't our fingernails do the same after a hot soak in the tub? Might be something to investigate when bored later. I have typed and said Cennini's name so much lately I'm starting to feel bad that I have no idea how to pronounce it. Keh-nee-nee? Cheh-nee-nee? I highly doubt it's Sen-nee-nee. I'll need to figure that out before I teach and have to say it several times. Again, I need a few tools for my A&S project. 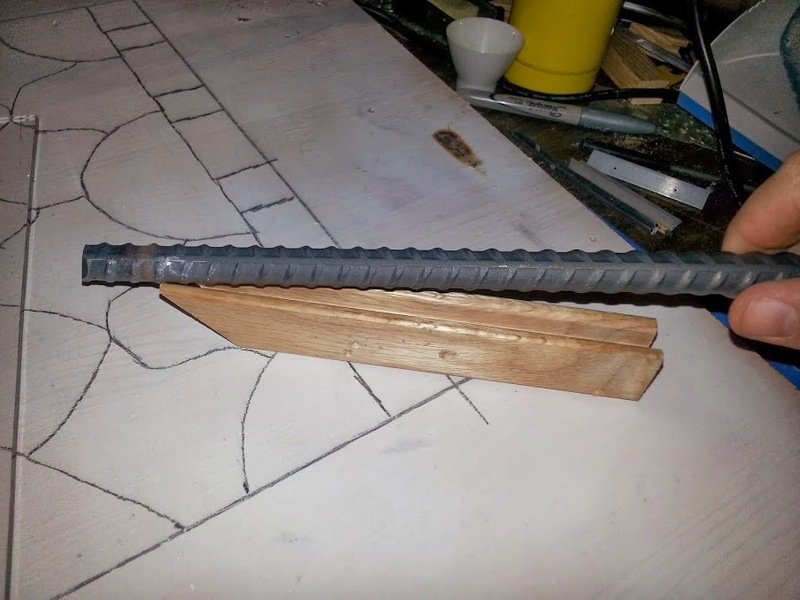 This spring I will have much more authentic ones made by a competent blacksmith, but for the moment it's me, my power tools, and metal stock from the hardware store. It needs a bit of a point or a chisel tip to give accurate transfer of heat to the glass. It needs to be of thicker stock, however, to hold heat long enough to work. 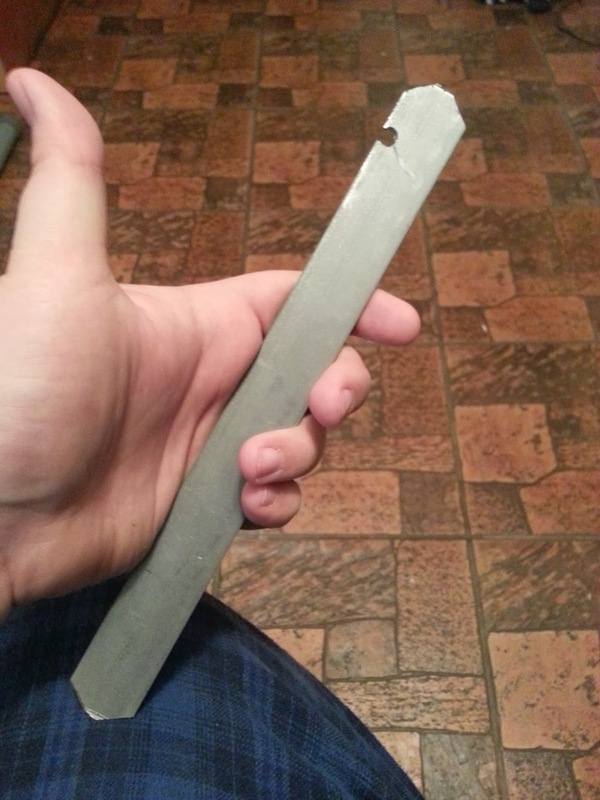 I initially created one out of 1/4" stock, and hand filed a point on it. It didn't work very well! It was too thin to hold heat for very long. I consulted with other SCA glassworkers and was tipped off that that was likely my problem. One friend explained she uses large square stock and uses the corner of the square as her point. I couldn't find solid square stock around me, and time is of the essence. Instead I bought round stock that was 3/4" thick. I looked at it, looked at my hand file, and witnesses may or may not have later described something akin to "whimpering." My two dividing irons. One is longer for fireplace/brazier work. One is short for torch heating at demos. It does successfully work. It can be a tad hard to control, but it works. Its a pretty neat feeling when it does! I created two irons. One is just short of 1 foot long, and the other just over 2 feet (3' stock originally). I did this because iron/steel is a surprisingly poor conductor of heat. On the foot-long iron one end can be room temperature and the other red hot. The short one is intended for heating in a blow torch, which is useful at demos and events where an open fire is not an option. It also fits into a small round case I have for my period hand tools. The longer one will sit in a fireplace or brazier of coals. Edit: You can find VIDEO of the iron at work at the end of a later post found here. This was a bit off-putting. I am, mundanely, a computer geek. I don't hunt for my food. I have two cats and a beagle. I like animals. I'm not naive, I know what tasty bacon comes from and I appreciate when hunter friends share venison with me. But I know I probably couldn't field dress an animal unless my survival depended on it. So, this ended up being a slight bit sad for me, handling little furry tails. Cennini is the earliest primary source I have on actually making paintbrushes. Consulting a friendly C&I Laurel suggested this was fine. She said that before him no one probably thought writing it down was necessary because of the normal apprenticeship process. The short version he detailed is you use minever fur and a tapered stick and join them using a quill as the ferrule. They are joined by some thread lashing. He wrote that you must take the tails of minever (stoats) and remove the ends, which have the longest fur. Then take the fur from the middle. Wet them in a goblet of clean water and press them into bunches. Then you take quills of varying sizes, vulture, goose, dove, and so on. 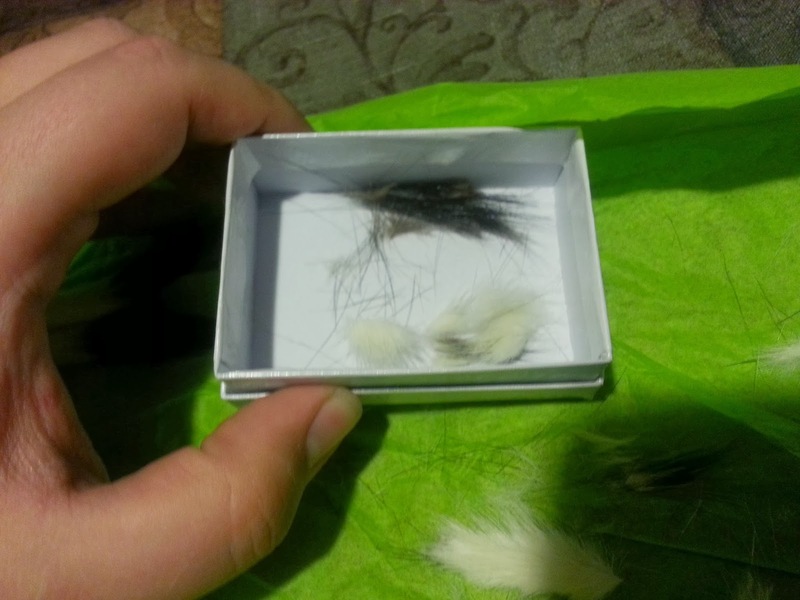 Put a bunch of fur of the appropriate size into the quill, and wrap it with silk thread*. 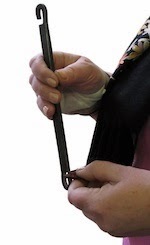 Then, insert a small stick of wood* into the other end, and again lash it on with the thread. This yields a minever brush that he says can be trimmed into a number of shapes appropriate for different jobs. 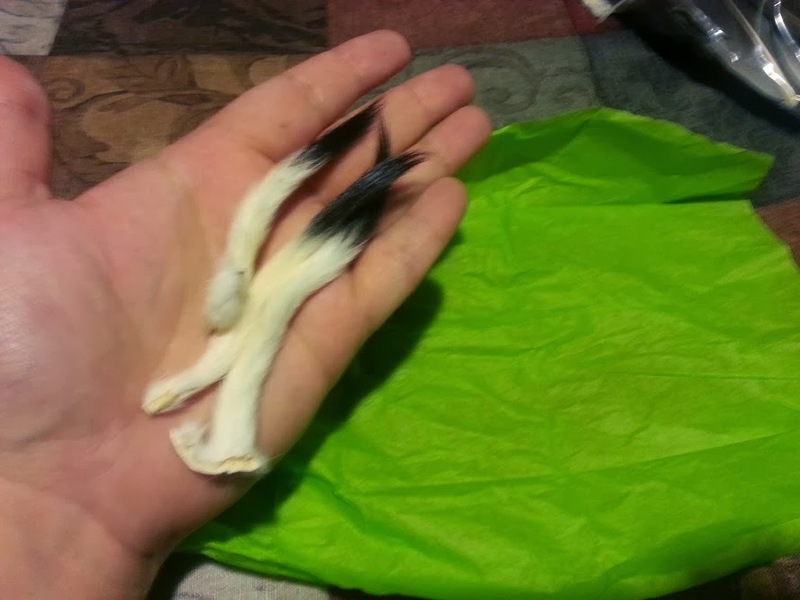 Stoat tails in a pretty standard adult male hand. Now I see why he talked about using the tails of five or six of them for a large brush.... Heralds, do these look familiar at all? The winter coat of the stoat is called ermine. I can't imagine how many tails it took to trim a garment! With only three tails to work with, I won't be making any large brushes. I also won't be painting any large murals, so I don't feel particularly worried about this. I plucked out a lot of the fur from the ends and middle of one tail. Wet the fur and pressed it into clumps on my table. Then I turned to my bag of quills. I hadn't realized that very little of the quill is hollow. I cut one at the far end only to discover I wasn't putting a stick into it. The picture is not ideal, but the quill wasn't hollow at this point. I found it a bit confusing at this point. He calls for a thin wooden stick, tapered, to be inserted and tied onto the quill and for my purposes I don't know why that is necessary. Despite Cennini's directions being in the glass section of Il Libro dell'Arte I wonder if the brushes he describe aren't used for larger paintings? He does describe a variety of sizes. Without having compared every feather type personally (vulture and dove, for example), some of the larger end seem larger than the modern brush sizes commonly recommended for glass painting by the "modern masters" and I notice a great deal of variety between the goose quills I have. At the smaller end, the feather itself seems to be a perfectly fine "stick." Their only obvious drawback is that the opposite end won't hold up for stickwork, scratching out paint as needed. As he described, I tied the waxed silk thread on and used it in a form of lashing. He calls for a "knot" and not a "lashing" and I don't know if they would have even recognized a difference. As an Eagle Scout I know them as two different things and I was initially tempted to use a form of lashing. In hindsight, what I was going to do would have poorly secured the fur to the quill. Instead I tied a simple square knot to start. From the written description I thought the idea was to tie the thread so tightly it constricted the quill. That was NOT happening. I didn't test the strength of the thread but I attempted to tie the knot directly over the quill first and pulled tight. I got nowhere [Edit: see "**" below]. I then rechecked the text, wondering if the quills were supposed to be soaked to make them workable, but that wasn't indicated. I tried again, tying the knot directly over the fur and tightly binding the hairs into a bundle. I then wrapped my way down the bundle, over the point of the end of the quill and down. I ended with a simple overhand knot, thinking again a little wax to seal it "makes sense." I didn't use that, however, as it wasn't called for. My first quill brush, with Cennini's book as a backdrop. I only have a few quills that may be large enough to accommodate both the fur and a tapered stick handle. For the purposes of this small brush I have left the quill as the handle. I think the next one, which will be larger and use the tails of the other two, will have the wooden handle. Likely so too will the hog-bristle brush I plan to make tomorrow as well. An edit will come later this month (March 2014) about the results of painting with this brush. 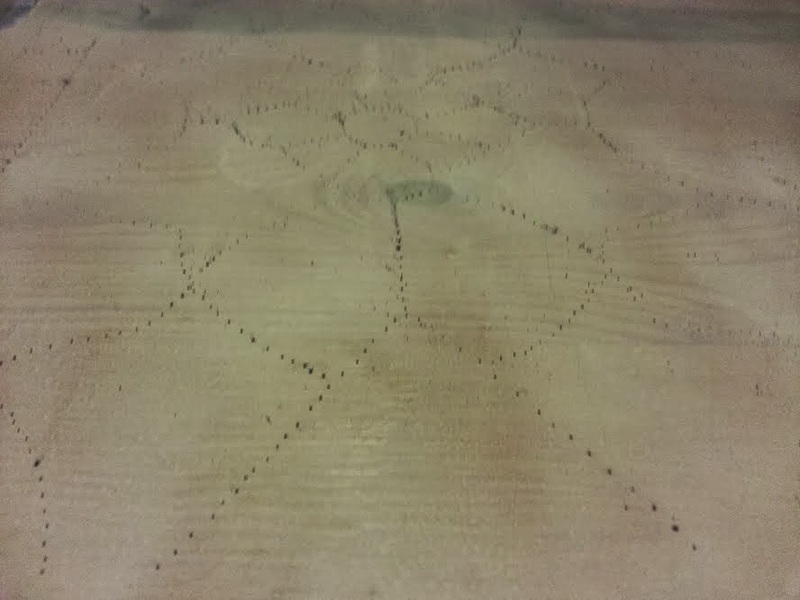 What is the impact of North American vs European quills? Are geese significantly different? Man, a little glue would do wonders. I'm not sure why they wouldn't have used that. Maybe glue was not as available or affordable in period? Might be another question for a C&I laurel. Mostly irrelevant, but a quick review of an episode of How It's Made shows that modern brushes are not held in using compression, but glue... at least, the large ones. [Edit: The knowledgeable and skilled Estelle de la Mer has informed me that period glues would likely have become weak quickly due to constant exposure to moisure. I'm curious how the quills compare. I can't find European turtle dove feathers available, but NorAm mourning doves are. I've ordered a few. I suspect the quills will be significantly smaller. The average length of the two breeds is only a few centimeters different. *Cennini listed specifics and alternatives. Silk thread is one he specifically mentioned. "or any other good wood" is also given as an option so I didn't go to a length to acquire a specific wood.